However, some ingredients or inputs required for making these foods would be taxed under GST. New Delhi: Dismissing media reports circulating about taxes levied on free food supplied in anna kshetras run by religious institutions under the Goods and Services Tax (GST), the Finance Ministry clarified that such food will not attract any charges. In a notification issues on Tuesday, the Ministry said 'prasadam' supplied by religious places like temples, mosques, churches and gurudwaras will not be subject to any Central, State or Integrated GST, as the case may be. However, some of the ingredients and input services required for making the same would be subject to taxation under the new regime. These include sugar, vegetable edible oils, ghee, butter, service for transportation of these goods and so on. Most of these inputs or input services have multiple uses. Therefore, under the GST, it is difficult to prescribe a separate tax rate for such items, when supplied for a particular purpose. Further, the GST being a multi-stage tax, end use-based exemptions or concessions are difficult to administer. Therefore, the GST does not envisage such exemptions. It would, therefore, not be desirable to provide similar exemption for inputs or input services for making prasadam or food for free distribution by religious institutions. 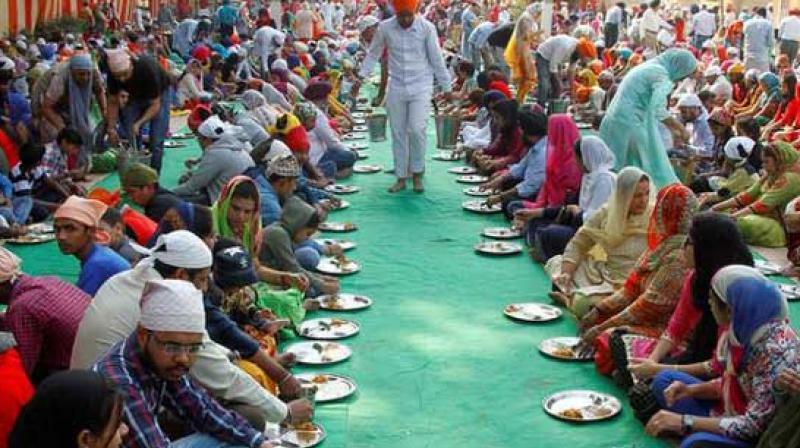 Earlier, on July 2, Union Food and Processing Minister Harsimrat Kaur Badal had urged Finance Minister Arun Jaitley to exempt all purchases made by the Shiromani Gurdwara Parbandhak Committee (SGPC) for 'langar sewa' or service at the community kitchen, under the GST. The SGPC spends around Rs. 75 crore to purchase desi ghee, sugar and pulses, all used in the preparation of food served in the Golden Temple in Amritsar. Citing this, the Minister said the committee would have to bear a financial burden of Rs. 10 crore on purchases, as they come under the 5 to 18 per cent GST bracket. The GST, which was rolled out at midnight on June 30, is expected to benefit all the stakeholders namely industry, government and consumer as it will lower the cost of goods and services give a boost to the economy and make the products and services globally competitive, giving a major boost to 'Make in India' initiative. Under the GST regime, exports will be zero-rated in entirety unlike the present system where refund of some of the taxes does not take place due to fragmented nature of indirect taxes between the Centre and the States. However, the GST will make India a common market with common tax rates and procedures and remove economic barriers. The GST is largely technology driven and will reduce the human interface to a great extent. The GST is expected to improve the Ease of Doing Business in India. In a majority of supplies of goods, the tax incidence approved by the GST Council is much lower than the present combined indirect tax rates levied [on account of central excise duty rates/embedded central excise duty rates/service tax post-clearance embedding, VAT rates or weighted average VAT rates, cascading of VAT over excise duty and tax incidence on account of CST, Octroi, Entry Tax] by the Centre and State(s).